Highpower Rifle Two-Track Option. Highpower Rifle events can now be conducted as either “National Trophy Events” with no sighters and rapid-fire series starting from standing or as “CMP Cup Matches” with two sighters per stage and rapid-fire series starting in position. Match Programs must state which rules track will be followed for a particular competition. New Courses of Fire. New events that have been added to the list of CMP-recognized events are the 30-shot Oliver Hazard Perry Match (200 and 600 yards), the 40-shot Springfield M1A Match (300 yards), the 20-shot Camp Perry 1000 Match (1000 yards) and the 45-shot Viale Long Range Match (800, 900 and 1000 yards). Senior Age. The age threshold for Seniors was lowered from 65 to 60. Classification Rules. 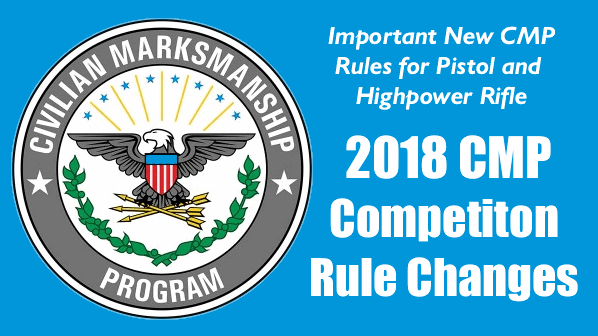 Rules for this new CMP program were updated to provide for continuing classification calculations to be made whenever another complete match result is added to a competitor’s database. Once a competitor has at least 240 recorded shots, older match results will not be included in classification calculations as long as at least 240 shots are used for the calculation. CMP classifications are available through on-line look-ups. Classification changes become effective as soon as new results are added to the database. Match Rifles. The new rules clarify that Match Rifles used in Mid and Long Range Matches may be single shot rifles and do not require magazines. Service Pistols. The new U.S. Government M17 and M18 9mm pistols and commercial equivalent SIG 320 pistols were added to the approved Service Pistol list along with the CZ P-10 C, FN P-9, H&K P2000, Kimber Custom Target II 1911, SIG P210 Target and SIG P320 X-Five pistols. Pistol Competition Rules. Rules for Pistol malfunctions, refires and scoring were added to eliminate the need to refer to a second NRA Rulebook. Highpower Rifle Scoring. The rule for scoring insufficient hits in rapid-fire was changed to provide that when there are no saved rounds, no excessive hits on adjacent targets, a double cannot be found and all shots are in the 9 and 10 rings, the missing tenth shot shall be scored according to the lowest value hit. The rule for scoring excessive hits in a rapid-fire series now provides for giving the high ten scores to the competitor when there are 11 or 12 hits. If there are 13 or more shots, the competitor may elect to accept the low ten or refire the series. Springfield M1A Match. There are new rules for the Springfield M1A Match as well as for the Long Range Rifle events (800, 900 and 1000 yards) that will become new CMP Matches at Camp Perry on 6-8 August 2018. Senior/Grand Senior Ages. The age threshold for Seniors is now 60; the age threshold for Grand Seniors was lowered to 70. Achievement Medal/Pin Scores. These scores, found in Annex F, were updated according to competitors’ scores in 2017 championships. Most changes were minor. New Events. Rules for the Glock Pistol Match were added. Score Falsification Enforcement. Score falsification is defined and clearly identified as a cause for disqualification for either a competitor or scorer. “Falsification” includes recording scores that are higher than scores actually fired by a competitor. Only Scorers can turn in signed scorecards. Penalty. An option to apply a two or five-point penalty in lieu of disqualification was added. Protest Procedures. Protest rules were revised to provide for a clear progression from a 1) complaint to 2) a verbal protest to 3) a written protest and request for a Jury decision. Rifle Shooting Jackets. Previous CMP Shooting News notices should have made it clear to competitors that rifle jackets with back or other braces or supports made of materials other than normal jacket materials are illegal. A stricter definition of materials that may or may not be used in rifle jackets was adopted in the 2018 Rules. Any competitors who still have rifle jackets that may violate this rule are urged to study Rule 4.6.1 in the Highpower Rifle Rules or Rule 3.5.1 in the CMP Games Rules and, if necessary, to take steps to ensure that their jackets are legal for competitions in 2018. Electronic Target Rules. 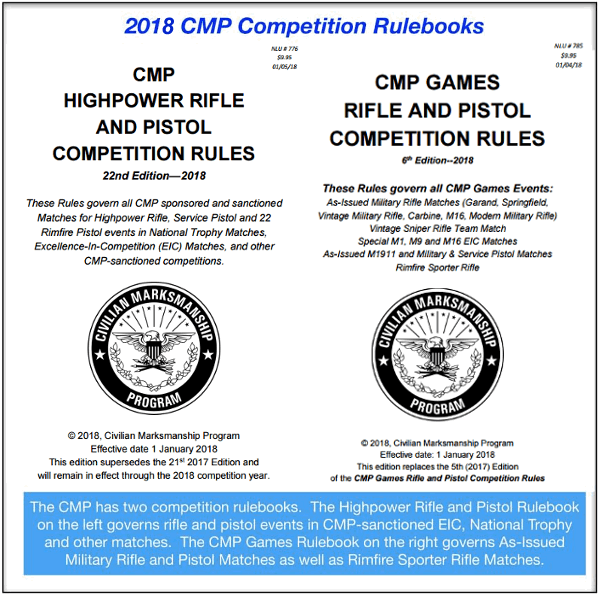 These rules were Annexes in the 2017 rules, but now have become Rule 7.0 in the Highpower Rifle Rules and Rule 9.0 in the CMP Games Rules. National Records. Rules providing for the official recognition of National Records in open and junior categories in CMP-recognized events were added. The CMP is compiling its first list of official records and will post it on the CMP website as soon as it is ready. 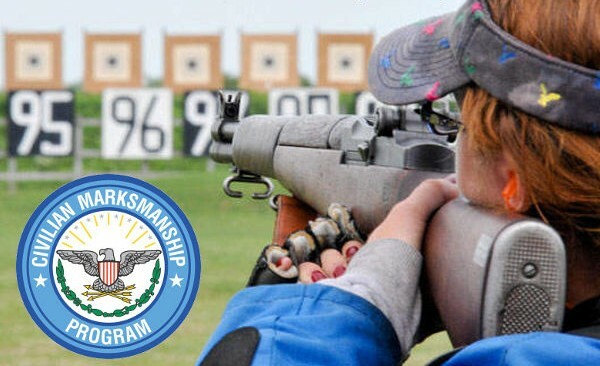 To be recognized as National Records, scores must be fired in the National Matches or in competitions conducted by the CMP staff such as CMP Travel Games or National Range Matches. For more information about the CMP and its programs, visit www.TheCMP.org. Any competitor or match sponsor with questions about the 2017 CMP Rules is invited to contact CMP Competitions at 419-635-2141, ext. 714 or 722 or by email at competitions@thecmp.org.